Louisville, KY (December 20, 2012) – As winter weather enters the region and brings falling temperatures, snow and ice to Kentucky’s roadways, Kentucky Farm Bureau (KFB) Insurance Companies urges all drivers to exercise extreme caution on their regular commutes. Slushy accumulations and icy patches may make roadways difficult to navigate, reduce tire traction, increase required braking distances and, at times, may limit driver visibility. Motorists must take extra caution when headed out under these conditions. While not everyone is able to completely avoid driving whenever it snows, all drivers can make a few advance preparations to help increase the chances for a safe journey. 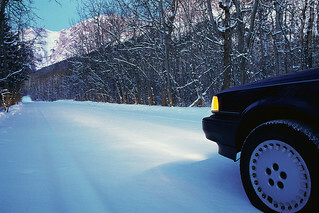 Vehicle upkeep and modified driving behaviors are essential in the winter as road and vehicle conditions are often quite different during this season than at other times of the year. • Tire treads – Special treads on snow tires provide optimal grip on icy roads, but at a minimum regular tires should be inspected to insure that an appropriate amount of tread is available on each wheel. • Air pressure – Measure the air pressure of each tire to make sure it is filled to the manufacturer’s suggested PSI (pounds per square inch). The PSI is listed in the owner’s manual as well as on a label found on the inside of the driver’s door. • Fluid levels – The salt and sand on the road that comes with winter weather removal often ends up on windshields, making it is essential to have a full tank of no-freeze washer fluid. Additional checks on the engine’s coolant system should also be made to spot leaks and make sure enough coolant is in the reservoir to withstand the colder winter temperatures. • Windshield wipers – Vision on the roadways is imperative but not always possible if a vehicle’s windshield wipers are worn. Replace wipers before the snow and ice hits. • Battery – It takes more power to start a vehicle in cold weather than in warmer conditions, and battery power drops as temperatures get colder. Have a mechanic check the charge on the vehicle’s battery and keep jumper cables handy for those extra cold mornings. • Gas tank – Fuel line freeze up is a wintertime headache in many driveways. Keep a vehicle’s tank at least two-thirds full during the winter to help keep air and condensation from freezing and preventing gas flow to the engine. • Headlights, mirrors and windows – Drivers should always remove ice and snow from all mirrors, windows and head and tail lights before pulling onto the road. The importance of being able to see and be seen on the road cannot be overemphasized. NEVER pour water on windows as this may cause the glass to shatter. • Check road conditions – Depending on the severity of the storm, some roads may be closed, blocked or extremely backed up. Plan the best route to travel before leaving home. • Allow extra travel time – When wintry weather covers Kentucky roads, everyone’s commute time slows down. Drivers should take the time to completely uncover their vehicle, leave early whenever possible and allow plenty of time to arrive at their destination. • Accelerate and decelerate slowly – Vehicles can better grip the road and avoid slipping if both the gas pedal and brake are applied slowly. A vehicle will not get moving – or slow down – quickly in the snow and ice. • Leave more space between vehicles – Coming to a complete stop in the snow may require up to four times as much room as it would in dry conditions. Avoid crashes by allowing more space on the road. • Practice driving in the snow – When it does snow, locate an empty section of a parking lot and become familiarized with the way vehicles handle in the snow. This is especially helpful for inexperienced drivers learning how to drive in wintry conditions for the first time. Above all, KFB Insurance Companies wants drivers to protect themselves and their passengers.